How can child support be spent? Am I responsible to pay for anything else beyond my monthly payments? When does child support begin and end? Answers to these questions often surprise divorcing parents. Below are five common misconceptions about child support in Nebraska. Misconception 1: If my ex-spouse and I share joint custody, no child support is owed by either parent. The amount of parenting time awarded directly impacts the amount of child support owed in Nebraska, but this is not the only factor used to determine whether child support is owed. In addition to parenting time, the income of both parents is considered as well. If two parents share an equal amount of parenting time, but one parent earns significantly more income than the other, then the higher-earning parent may still owe child support. 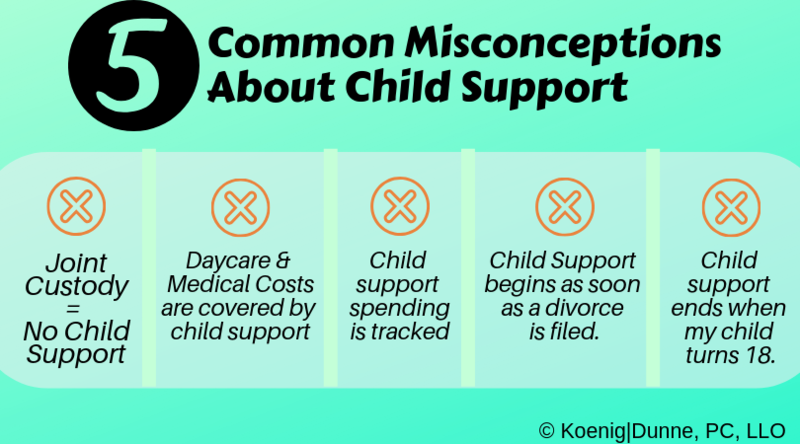 Misconception 2: My share of daycare and out-of-pocket medical expenses are covered by my monthly child support payment. Daycare and out-of-pocket medical expenses are shared between parents apart from monthly child support payments. These expenses are shared proportionally based upon the relative percentages of both parents’ incomes. For example, if Parent A earns $6,000 per month, and Parent B earns $4,000 per month, then Parent A would be responsible for 60% of these costs while parent B would be responsible for 40% of these cost—above any monthly child support obligation. Misconception 3: A parent paying child support can demand an accounting of how that child support is being spent. Nebraska law does not allow parents paying child support to demand an accounting of how such child support is being spent by the other parent. Misconception 4: Child support begins as soon as a parent files for divorce. Child support does not begin as soon as a parent files for divorce. Instead, child support begins as soon as a Court orders child support to begin, which occurs at the time of a temporary hearing or in the final divorce documents. Temporary hearings can take place within a month or two of filing for divorce. Misconception 5: Child support ends when my child turns 18. In Nebraska, the age of majority (adulthood) is 19 under state law, and thus child support does not terminate until a child turns 19. The gravity of misconceptions surrounding child support cannot be understated. Your legal team at Koenig|Dunne is here to answer your questions about child support and to advocate for your rights in determining child support.